Last summer, New Scientist reported that a "contaminated lake" in Montana is actually "turning out to be a source of novel chemicals that could help fight migraines and cancer." Berkeley Pit Lake, as it's called, is really a flooded, open pit copper mine. "Dissolved metal compounds such as iron pyrites give the lake a pH of 2.5 that makes it impossible for most aquatic life to survive," New Scientist explains – but "novel forms of fungi and bacteria" have been discovered in its waters. These include "a strain of the pithomyces fungi" that, if used medically, "could block headaches," and "a strain of penicillium fungi" that might help prevent "the growth of lung cancer cells." Somewhat ironically, the scientist behind all these discoveries is now "rushing to identify more of these extremophile creatures before the toxic site is cleaned up." 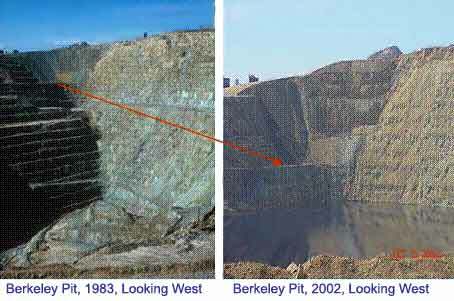 After all, Berkeley Pit Lake is "one of the most toxic mining sites in the western United States" – even if it is a rather unexpected medical resource. An interesting question here, though, is whether the lake's very toxicity has caused some of the cancers its extremophile inhabitants can now help cure. Landscapes of instant karma. Another question: once most of London is flooded, might future scientists stumble upon strange new medical compounds floating in the waters of that inland sea? It could be a new pharmaceutical technique: flood something. Come back in 20 years. Hah. The opposite of the find-medicine-in-the-rainforest approach.